Today, we’re beyond excited because it’s been a while since we happened to review a brand that’s as fresh and good looking as the VoltSurf. Exaggeration aside; the VoltSurf boards are quite striking with their colors and build quality, and honestly; our team couldn’t help but wow and praise how good these boards felt and looked. The name VoltSurf is not so old in the industry of stand up paddle boards, however, and sure enough; it’s a name that managed to pull every string in order to make one hell of a head turning iSUPs’ line. Not only that; VoltSurf promises their clients the best service possible as they also removed the middlemen from the equation offering you factory direct pricing. 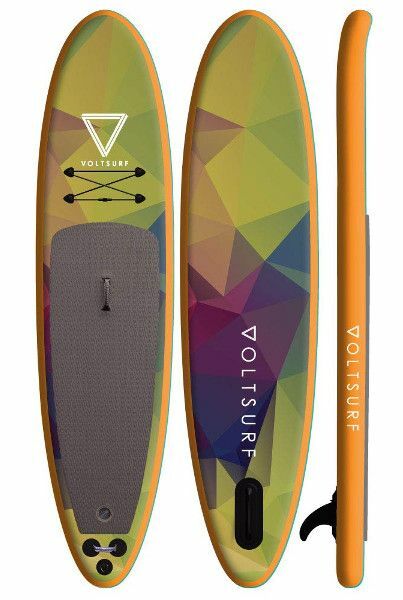 The people behind VoltSurf are unquestionably young and wise enough to understand that a person who’s interested in an inflatable standup paddle board is someone who’s in for an active life style that includes travelling, working out and an awful lot of adventures and discoveries. 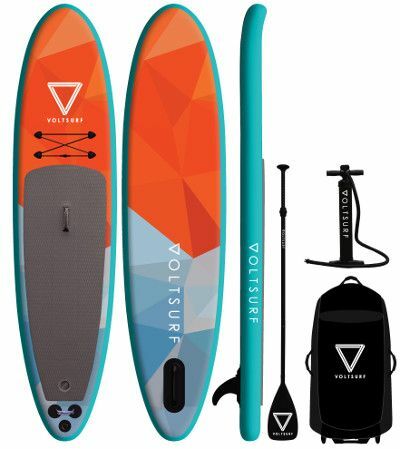 Thus, here we are today with an awesome VoltSurf all-round inflatable stand up paddle board that is guaranteed to get you plenty of high fives while making some jaws drop. Let me just say this; the Rover offers the perfect size for an all-round iSUP; no joke. This board is a solid 11 feet long, 32 inches wide and 6 inches thick and this my friend is pure perfection. The length here is great for touring and speeding up as it also offers so much space for all riders to be completely comfortable with their size. The 32 inches you’ll get on width is going to allow you maximum stability and control which leads us to mention how great of an iSUP the Rover could be for a beginner. Thickness is also a crucial aspect for any inflatable board; the thicker the board, the better it’ll perform. Having 6 inches thickness on this one means you won’t ever have to worry about your feet submerging in water even when you hit maximum weight capacity (325 lbs). First things first; you can spot quality just by the looks of it. 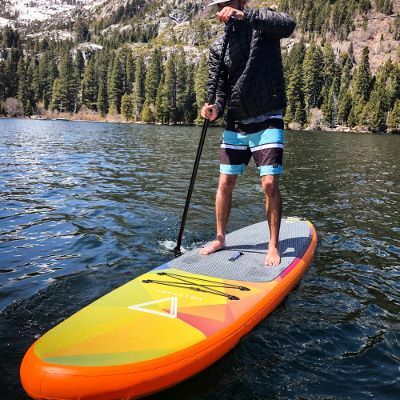 The VoltSurf Rover has a breathtaking halo to it; the size, the shape, the colors and design, it’ll all strike you with a great deal of soulfulness that’s put into this iSUP. The Rover board is made of the highest tensile strength drop-stitch fibers that took shape in 2 layers on each side and part of the board. As a result, this board is one hell of a tough iSUP to the point that you might even forget that it’s only inflatable. The air drop construction here allows the board to safely take over 15 PSI without getting damaged or losing shape no matter how many times you inflate or deflate it. Not only that; the traction pad, which is a main feature to any iSUP, is super soft and stiff adding up to the board’s whole hardness and rigidity. The details are also extremely neat; you wouldn’t be able to easily spot where a part starts or ends because everything is very well blended to look like one single coherent body. The VoltSurf Rover comes in 4 amazing colors; Black, Orange, Pink and Turquoise. When I say black or pink it’s only the rail sides that are so; the rest of the board’s body is highlighted with soft geometric shapes that, one way or another, represent the brand’s logo. As far as I’m concerned; the color choices can almost talk to you of how beautiful they are. Having already mentioned the traction pad we might as well talk about what’s left to it. This pad is a diamond grooved one with a remarkable ability to boost your control over both; the board and your body. Moreover, as thick and durable this pad is, it’s also super comfortable for your feet so that you can stand or lie down on it without harming any part of your body. Another feature is the captain central handle. It’ll make it possible for you to firmly carry the inflated board without any need for a second hand. You’ll find an additional handle to the board’s tail and that one is great for when you coming out of the water with your board dragged behind you. Next, there is a storage area on the board’s front deck with 4 D-rings and a durable bungee cord. This feature comes very handy for long distance tours and trips where you need couple items and belongings on you. The bungee cord will allow you to easily secure anything you like to the board while it’s right under your eye. Last but not least, the Rover is featured with one single removable fin which is meant to simulate the same navigation system you’re most likely to find on authentic board. It doesn’t require any tools or hardware to be installed and it could be easily replaced in case it ever got lost. If anything at all, the VoltSurf Rover is one of the most versatile iSUPs that you can ever own. The Rover’s body is so firm to the point where cruising water feels like knifing through a cake; smooth and effortless. The fact that this board is 32 inches wide makes it a great iSUP for beginners as previously mentioned. It’ll support your weight and make sure your stand tall in no time since it’s nearly impossible to cause such a thick and wide board to capsize. Furthermore, the possibilities are endless with a board like the Rover; you can surf, play yoga, pull some maneuvers or go racing…it’s all doable here and no one/nothing can stop you. A 3 piece adjustable and floating paddle. A dual action hand pump which will reduce your pumping time by nearly half. A wheeled carry backpack with extra room to fit your personal belongings along with the board, paddle and pump. The package clearly lacks a repair kit and an ankle leash which are 2 things you could easily get with many other brands. However, and as I see it; you might never need a repair kit unless something extreme happened, while you can use any available leash at hand. The VoltSurf Rover is an extremely attractive board. It’s designed with perfect dimensions. It’s extremely tough and versatile. It comes with a great wheeled backpack. It’s suitable for all skill levels including beginners.